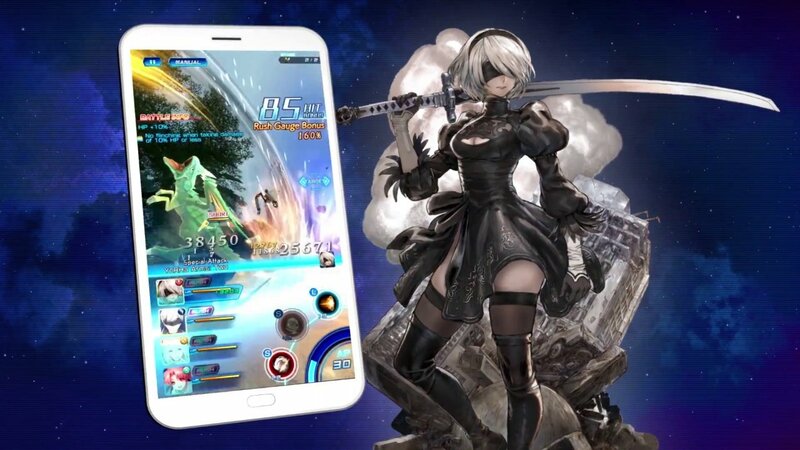 Shortly after revealing that 2B from Nier: Automata is joining Soulcalibur VI, Square Enix shared a new video, featuring their collaboration with Star Ocean: Anamnesis on iOS and Android devices. It appears that 2B and her cohorts A2 and 9S are now playable for a limited time, through November 27. Not a huge surprise since Square Enix are this game’s distributor, but surely a pleasant one. All three characters have their unique stats and abilities. 2B is a 5-star Ace Attacker and can smash nearby enemies. 9S is defined as a 5-star Sharpshooter and has high-speed movements that help him minimize any damage by evading quickly. Finally, A2 is a 5-Star Defender, and you don’t want to get in her way when she enters her RUSH mode. Their weapons of choice are also available for this limited period. Players who log in daily could earn valuable rewards such as 5-star tickets for weapons, characters and so on, all that on top of the regular bonuses. Furthermore, players can obtain some sweet Nier gear if they successfully challenge the Tomb of Remembrance during this time and will have a higher probability of a getting “Great Success” upon character enhancement. If you want to learn more about this collaboration you are welcome to watch the SE Mobile Community Stream today, November 14, at 1:00 p.m. PST. You’ll have a special encounter with the voices of 2B (Kira Buckland) and 9S (Kyle McCarley) during the first portion of the stream, who will join Square Enix members to challenge the Tomb of Remembrance. After that, you’ll get the opportunity to watch the Global Producer, Takaaki Kai, himself playing some multiplayer matches with his growing community, and will discuss the background of the collaboration. If you decide to install Star Ocean: Anamnesis right now, you will take part in the Welcome Aboard campaign as long you do it before 11:00 p.m. PST on November 26. By joining the community, you’ll gain 2,000 Gems, a 5-star Ace Character Ticket, three 5-star Character Tickets, a 5-star Weapon Ticket and some more goodies that’ll help you jump right into the action. Star Ocean: Anamnesis is the latest episode in the Star Ocean saga, and is available on both the App Store and Google Play for free download.